I'm writing this article (and filmed the accompanying video) based upon real-life experiences. The best stories are grounded in reality. Right? If you've heard any of Mary Carter's (Mary Carter is my wife and she's the founder of Hemp Oil Rockstar and The Carolina Hemp Hut), then you may know that the primary reason she dove into the CBD world is because she was worried that my cancer would return. A little less than two years ago, Mary got me going with CBD Oil from a vendor recommended by an acquaintance. This new oil was very expensive (about $130 for less than a month's usage). I was filling in time while watching a show with my wife. My iPad was in my lap and I was cruising the web in search of CBD for cheap. I found site that had all of the requisite language and pretty pictures. Star Trial CBD was calling me. It was late in the evening and to my benefit, I wasn't supposed to be buying anything. I didn't have my reading glasses on. 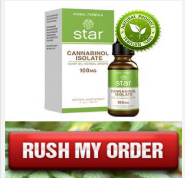 I shouldn't have even considered looking at the ad for this CBD oil. The CBD Oil which you can buy from Hemp Oil Rockstar, Charlotte's Web and others is going to come from reputable farms, reputable refiners and from reputable retailers. SOME of the CBD that comes from some shops, however, leaves a lot to be desired. Some retailers have been buying CBD oil in concentrate (from isolate or from spectrum). They take this relatively strong isolate and blend the CBD oil with various calculated amounts of things like MCT (think, cleaned up coconut oil), sunflower seed oil or another carrier oil. This process is actually normal. Again, the reputable vendors will make sure that their oil sold matches the strength and the content (you'd be surprised that the shady providers will often "water down" their oils to considerably less than the stated strength). The Star brand of CBD Oil is from an isolate. It's also very weak (100 mg of CBD only). This means it's packaged with carrier oils. Thus, the 1 oz bottle that they package this oil within is really a 1 oz bottle of carrier oil with a drop or few of concentrated CBD Oil isolate. Gimmicky advertising and names like "Hemp Pure" or "Pure CBD" are therefore a bit misleading. It's not pure CBD Oil. The Trial Offer programs will sign you up to a "buying club" of sorts with your trial offer. The prices of the various scamming offers on the web do vary, but they're typically around $5.00 a bottle. "Wow, CBD Oil for only $4.95?!" Yes, you can bet I was excited. With my addled view (recall that I didn't have my reading glasses on - so, screw the fine print) I could clearly see I get a bottle of CBD oil in a free bottle to try out. Well, I needed CBD oil - so SIGN ME UP! I actually received the product that they had specified. However, it wasn't in a fancy cardboard box like it was in the photos on the web site. I didn't get crazy of this though. The product was the 100mg bottle of CBD oil. Just the bottle. I slid the bottle back into it's padded envelope and tossed it aside - I had lots of work to do and the bottle was not a priority. A couple of weeks later, as I finally had some spare time, I opened the package again and read the bottle of CBD oil. It dawned on me that it was only 100 mg when I bought it. But, I figured that $5 was worth it. The $5 wasn't all though. My credit card statement revealed that I was charged for the shipping and handling fee of $4.95. I also was charged a few days later for a "membership fee". Uh, what? To add insult to injury, I receive a second bottle of 100mg oil and a shocking charge of nearly $100 on my Credit Card statement. This drove me to action. I ended up taking care of the transaction and canceling everything with the "staff" at this company (it was Star brand, but the call center sounds like a sweatshop filled with people taking complaint calls). The mail order company had a clever trial gimmick which captured people within a "club" which has a monthly fee and the product cost which was exorbitant. I learned from this experience. Now I carefully read the terms and conditions of all "memberships" and order fine print. I grab my reading glasses when I see something that's "too good to be true." Since it's often too good to be true, I am safer being more of a stickler to the details. If you'd like a list of Scam centered Trial Basis companies, let me know in the comments and I will get the list emailed to you. I keep making additions to the list - this way more people are aware. We discovered that this is a UPS Mailing location. Hmm. This means that Brighten CBD, Star and so many others who are scamming everyone with subpar CBD at exorbitant price levels and trial offer gimmicks are operating out of a UPS Store location. Yep, go into the UPS location and ask for the head honcho of Star CBD and they will stare at you like you have two heads. We went through the web and researched further into the sites run buy the crooks at AOH health. Notice the "Attractive Character" with blue stethoscope in many of the Scam sites (note, they change the color of the stethoscope in many of the images and switch the position of the character). Pure CBD Free Trial :(Update 2018) CBD Oil Free Trial, Miracle Drop! This tells us that the company isn't really "there". They get their complaint mail there, but nobody is actually in an office there. Here's one thing you need to consider as well: If a company is offering a bottle of Hemp Oil Extract that is 30ml or larger for FREE, something fishy is going on. A Partial List of Scam Offers for CBD Oil. Please, tell your friends that these sites are operated by slimy individuals who are using CBD as a way to take money from people dishonestly using all sorts of tricky methods instead of being straight up and honest.